Jerome Le Banner, the legendary Kickboxer from France, was set to headline GLORY 10 Los Angeles against former PRIDE and Strikeforce superstar Sergei Kharitonov in the event’s main event, but now it looks like Le Banner will be out of the event, citing a neck injury. It isn’t clear for how long Le Banner will be out, but Kharitonov will be moved to another upcoming GLORY event and given a new opponent. 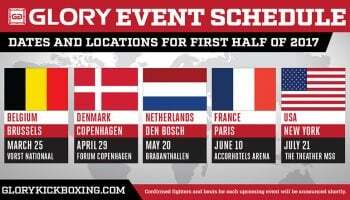 That means that GLORY 10 is out a main event and that Robin Van Roosmalen vs. Shemsi Beqiri has been bumped up to the main event slot and that Davit Kiria vs. Murthel Groenhart has been put in the co-main slot. For kickboxing fans this is kind of good news, as two of the better fights on the card will be given top billing and featured more prominently. Hard to complain about that, right?